Dragonflies are fascinating insects that have captured our attention down through the ages. They have been the subject of countless stories, poetry and lore. Strangely beautiful with their large eyes, long bodies, and four large wings, hovering effortlessly in the air, they are the original drone. Dragonflies are superior in agility and deadly to a fault. With their bright, bold colors, their beauty is undeniable. Iridescent rainbows of color can often be observed refracting off their transparent wings in direct sunlight. Dragonfly wings may just be the most beautiful sun catchers of all. There are over 5,000 species of dragonflies in the world, ranging in a kaleidoscope of colors and patterns. 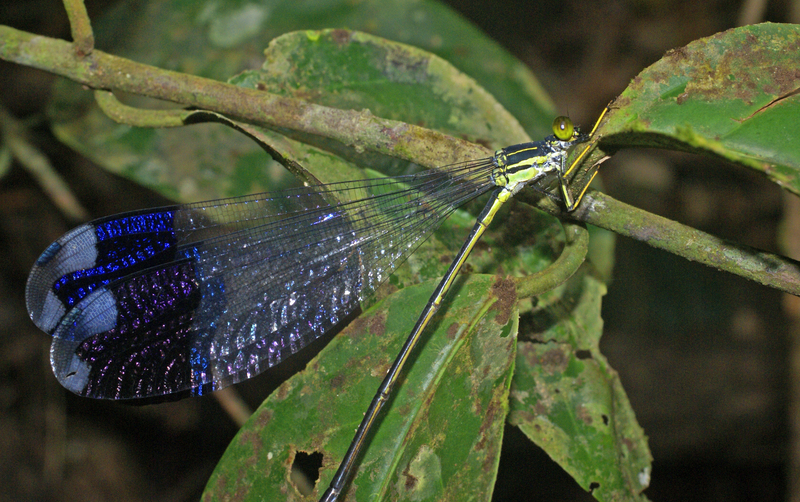 The largest dragonfly, seen here in a photograph by Andres Hernandez, is called Megaloprepus caerulatus, and has a long, slender body that is nearly five inches long with a wingspan of 7.5 inches, and can be found in Central and South America. The Swamp Darner (seen below) of the Southeastern United States is slightly smaller in length, but with a heavier body. Dragonflies may be beautiful, but they certainly aren’t docile. They are fierce predators, able to pursue their prey at high speeds (up to 35mph), intercept them in mid-flight, and devour them mercilessly with their huge mandibles. Since they prey mostly on other small insects including mosquitoes, they are actually beneficial for the environment. Butterfly gardens are popular everywhere, but create a dragonfly garden, and your yard will certainly have less of those pesky, biting bugs. But beware! Butterflies are on the menu of this ferocious little creature, so you may have to make a choice. The dragonfly begins life in the water. Most dragonflies will lay their eggs near freshwater. A few species lay their eggs in saltwater. As the larva grows, it will eat almost anything including fish, tadpoles and other insect larva. Once it emerges from the water, it begins to forage on the wing. The dragonfly has muscles in its thorax that control each wing separately. They are able to change the individual angle of each wing, allowing them to hover, fly sideways or even backwards with ease. Dragonflies have extraordinary sight due to their large compound eyes, giving them nearly 360° vision. This superior vision helps them in targeting and singling out their prey during flight. They are able to determine a trajectory path to intercept prey at an astoundingly accurate rate. Dragonflies are a sight to behold and a force to be reckoned with. The next time you cross paths with one of these creatures, stop and take a closer look. You’ll be glad you did. You’ll also be glad you are not the one on the menu! Next Next post: California Sea Lions – Naughty Or Nice? All photography and artwork displayed on this website are original and property of Ofwaterfallsandtrails Photography, unless otherwise stated. ©2017 All rights reserved.